SMBP is a volunteer led charity which brings together over 130 professional services firms, commercial organisations and professional sports teams committed to supporting students from low income backgrounds in their pursuit of a career, in particular, as a legal or finance professional. SMBP currently runs programmes to include students from Belfast, Birmingham, Blackpool, Bradford, Brighton, Bristol, Glasgow, Leeds, London, Manchester, Norwich, Oldham and Reading, successfully unifying efforts to promote social mobility in the legal and accountancy professions through partnerships with the Solicitors Regulation Authority, ACCA, the ICEAW, CILEx, Law Society of Scotland, Law Society of Northern Ireland, The Bar Standards Board, The Faculty of Advocates, ACCA, ICAS, IntoUniversity and the Sutton Trust. assist students with each step of their career journey through online virtual coaching on Personal Statement/CV creation, completion of application forms and interview preparation. The programme starts with an induction where students learn about pathways to the professions from our supporting regulatory partners, the future impact of AI on the delivery of professional services and the facts about university finance. The students participate in a week-long work insight and skills experience in which they are given the opportunity to spend a day at four different businesses; in addition, they attend a day run by a professional sports club to learn about the psychology of resilience and goal achievement models. Finally, students have access to online ‘virtual coaching’ from legal, accountancy and business professionals. Our coaches are on hand to help with creating Personal Statements/CVs, compiling application forms and preparing for interviews. A SMBP ‘Student Journey on a Page’ can be accessed by clicking here. Click here: if you want to support SMBP nationwide. 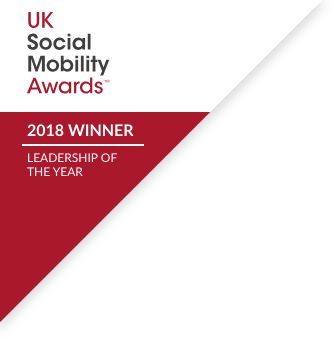 Copyright © 2018 – Social Mobility Business Partnership is a registered trademark belonging to Social Mobility Business Partnership (charity 1174309). BARCLAYS and the Eagle Logo are registered trademarks of the Barclays Bank group of companies, used under licence.